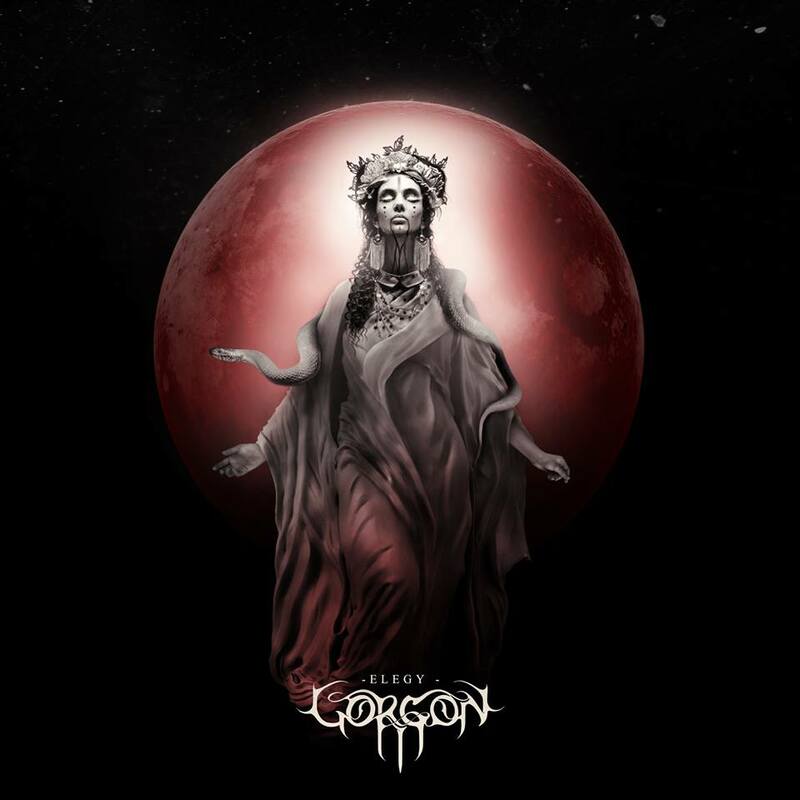 Gorgon is a French symphonic death metal band that has only put out two full-length releases. The debut Titanomachy was released in May 2016 and the sophomore Elegy popped on the radar January 18th this year. It is the brainchild of frontman Paul Thureau. With such a short story to tell, you would say that these guys are rookies, but only a few seconds into this record will prove otherwise. The opener “Origins” leads into the sheer aggression that defines Gorgon’s sound without excessive introduction and sets the tone for what will be a beastly album. The power and intensity that these guys throw at you is just crippling. Fast guitar and bass riffs with intense triggered double kicks and blasts on the drums, lay the drilling backbone of the music, bordering on black metal style more than once. In addition to the instrumental savagery, Paul’s growling voice also reaches some of the lowest notes to have ploughed through my headphones. The constant rumble is very rarely interrupted and when it is the grooves that come aren’t exactly coated with honey either. Obviously this band has a lot of expertise in dealing with the low-frequency spectrum, and mix-wise they do justice to the depth of their sound while still maintaining a decently clear and understandable sound. To counterbalance the ferocity of their style, this band has a not so common side to their sound that cannot slip by unnoticed. After all, symphonic death must have a symphonic side but we’re not talking about cheesy layered chord sampling. The guys went for an oriental Arabic influence to work alongside their metal instrumentation and even worked with a Tunisian female singer to make the whole Assasin’s Creed vibe come alive. Safa Heraghi’s voice makes up for a huge part of the atmosphere in Elegy, and the decision to include her proves Paul’s desire to make his vision as genuine as possible. While the savagery turned to eleven would have easily given Gorgon enough wow-factor, they still stepped up the game with this radically different dimension and I must applaud the way they put these two different aspects together. Lyrically, the album brings together female characters, either from religion or mythological stories at the forefront, with each song relating to one of these feminine figures. Some names that might ring a bell are Pandora, Hecate or Eve. Conceptually, it aims at dismantling concepts of duality in the Universe, thus further enforcing the seamless association of their contrasting musical elements. Viewing the music from this perspective, the oriental aspect of Gorgon’s music grows even more meaningful, making this vision work effortlessly. With all the different elements coming together, the album gives a sense of surprise as well as familiarity in terms of extreme death metal riffing, and it seems to grow in power and intensity with every song, peaking with the massive “Of Divinity and Flesh”. The flow of the album leads into the dark and serene instrumental title track, wrapping up in an elegant way. The oriental influences and exceptional guitars and drums on this record give Gorgon their distinct personality, but if I were to find a resemblance to a different band, it would have to be Septicflesh. If you’re a fan of these death metal overlords, you will most certainly be pleased with Elegy, and for melodic death metal or black metal fans in general, this record already makes 2019 look promising. This entry was posted in Bands, Black Metal, Death Metal, Reviews and tagged 2019, 8.5/10, black metal, Death Metal, Dusktone Records, elegy, France, Gorgon, LP, orchestra, orchestral, oriental, Septicflesh, symphonic, symphonic death.